Pro Tip: Don’t miss a single play—or commercial—in the kitchen. Head into game day with a handful of deliciously easy apps that will have your fans cheering until next season. On game day, we’re all about less cook time and more couch time. Here are three of our all-time favorite game day appetizers, made with EatingWell® frozen entrées. – Heat the Cherry Port Pork frozen entrée according to package directions & stir to mix ingredients. – While the entrée is cooking, slice the slider buns in half & slice jalapeño pepper. 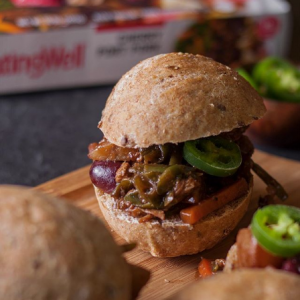 – Spoon the Cherry Port Pork mixture onto slider buns & top with peppers for a kick! – Heat French Inspired Chicken frozen entrée according to package directions. – Preheat oven & bake french fries according to directions on package. – Combine cooked entrée with ½ cup of cream of mushroom soup. 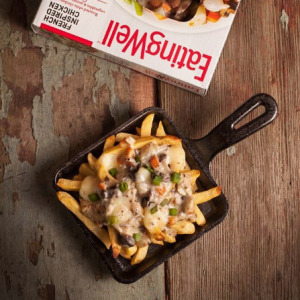 – Place cooked fries in a small cast iron pan (or oven safe dish) & top with entrée/soup mixture & cheese curds. – Bake at 375 degrees for 10 minutes. – Remove from oven & top with scallions. – Heat Steak Carne Asada entrée according to package directions. – Once entrée is cooked, combine steak & vegetables together (mix in rice if you prefer). 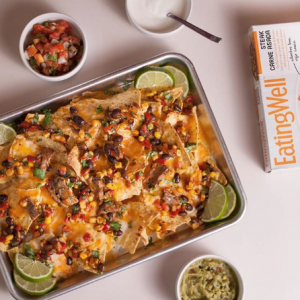 – Line baking sheet with tortilla chips & top with cheese, onions & Steak Carne Asada mixture. – Bake for 8-10 minutes until cheese is melted. – Sprinkle chopped cilantro on top & serve with guacamole, pico de gallo & sour cream.